A problem is that some of the best sites, for example, http://viatolosana.free.fr/ , are not available in English. I use the Google toolbar, and one of the optional buttons on it is translate. When I find site that is French, I just have to click Translate web page on the toolbar, and I can navigate successfully thru the site. This allowed me to order guides from Amazon France even though my French is pitiful. For an English language site, I haven't found any site that provides nearly as much info as ours - the one you are looking at this instant. Further down we have a detailed day by day spreadsheet with km from point to point, etc. Also we have guidebook info and city map info. Possible good Website for Arles GR 653 Route: http://www.santiago-via-arles.fr/ is under construction. There used to be an excellent link called www.santiago-via-arles.org and I think this is its replacement, but not working yet. More Arles GR 653 Info: http://chemindarles.free.fr/index_EN.php and http://www.peterrobins.co.uk/camino/routes/toulouse . A diary of someone's 1998 walk from Arles: http://www27.brinkster.com/relenberg/santiago/meine_e.htm . For those of you with only minimal French, this is a site I have found useful: lawlessfrench.com Knowing French is not mandatory for walking in France, but it greatly improves the experience. However, is is best used along with the accompanying 2nd edition textbook: French in Action. The 01-01 stands for chapter and exercise, so you must change for each exercise. I just paste the url into my windows media player open url window. Also for better control of audio playback, download the free audio editor Audacity and just paste the url into the Audacity open window where it says filename. Starts flat, long days and not too interesting, but after Montpellier, some true mountain trails, great views, and quite a bit more rugged than the Le Puy GR 65 route. Most days no facilities between start of day and end of day, so need to carry lunch supplies. Our plan followed the normal stages, and km per day were typically in the 22 to 27 km range. After three days of dragging in tired each night, and having to start early the next day without seeing the village, we modified our plan and stuck in some short days of 13 km or so. That meant we didn't reach Toulouse, but had a more enjoyable trip. Usually reserved the next night's accommodation, and regretted it the few times we didn't. We saw few pilgrims, but pilgrim level accommodations have few beds, so best to call ahead. This trip was in Sept. and weather was good. Only wore raingear a few hours. It was quite windy in some spots and I wore my wind jacket daily, and wind pants for about 3 days. We used trail runners with no problems. Having French at a sufficient level to carry on basic conversations with French pilgrims would greatly improve the experience. 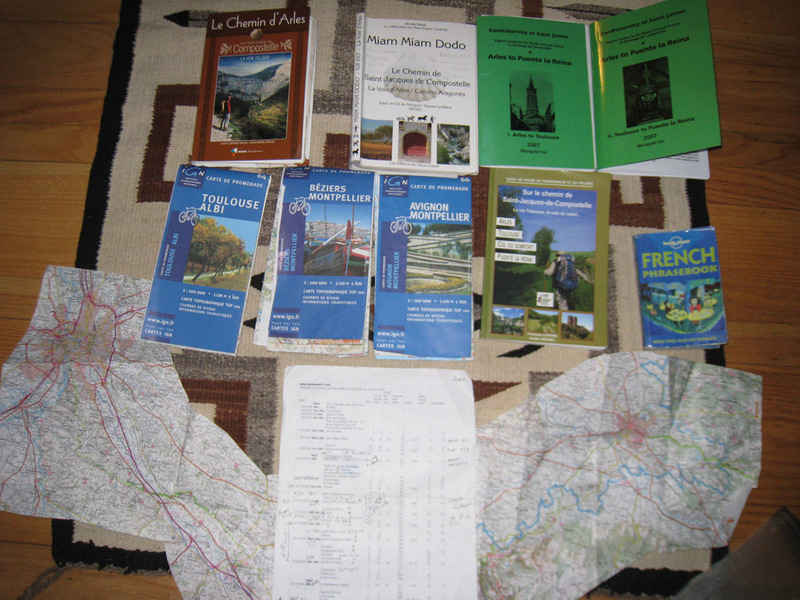 We started out with three, the 2007 CFSJ guide for Arles - Puente la Reina i. Arles to Toulouse by Marigold Fox, the Le Chemin d'Arles vers Saint-Jacques-de-Compostelle by Balen & Siréjol, and the miam-miam-dodo du chemin d'Arles (the last two in French). We also carried some of the updates to the CFSJ 2004 guide, since they didn't seem to be incorporated in the 2007 guide. Part way thru, we bought Sur le chemin de Saint-Jacques-de-Compostelle La via Tolosana, la voie du soleil by Lepere & Dehnel (in French). This is a 2008 version though nothing in it contains the date, and there is a 2003 version with the same isbn. When we did this there was not a TopoGuide for the GR 653, but Balen & Siréjol was the closest thing to it, but lacked the 1/50000 maps, just has strip maps. They do have a good city map of Toulouse with the routes thru the city clearly marked. In 2009 and 2010 TopoGuides were published and are listed below. Louis Laborde-Balen - Jean-Pierre Siréjol Le chemin d'Arles vers Saint-Jacques-de-Compostelle. We ordered this from Amazon France. It is listed in us and uk, but not available - isbn 9782841823475. Mireille Retail, Marie-Virginie Cambriels Miam-miam-dodo du chemin d'Arles + le camino aragonés : Chemin de Compostelle (GR 653) d'Arles au col du Somport, du Somport à Puente la Reina isbn 9782916446127 - We ordered this from Amazon France. Francois Lepere & André Dehnel Sur le chemin de Saint-Jacques-de-Compostelle, la via Tolosona, la voie du soleil... We bought this from a CH en route. It doesn't have a printing date, and Amazon France lists the same isbn saying it is 2003 edition, and has no image. The site in the link is the only one with the correct image, but don't know if you can order from them. We used very little. Les Chemins De Saint Jacques De Compostelle En Europe - a map showing all the routes to Santiago de Compostella through Europe. In French, for before or after trip, not something you take with you. Birgit Götzmann Frankreich: Jakobsweg Via Tolosana (Taschenbuch) A guide to the Arles route in German. You can browse it with Amazon Germany's Search in the Book. Sentier vers Saint-Jacques de-Compostelle : Via Arles-Montgenèvre-Arles (Broché) For the Via Domitia from Arles to Rome, there is a new TopoGuide. www.caminoguide.net has free guides for via de la plata and camino aragones, and a for fee downloadable guide to the Camino Francés. We also carried the IGN 1/100000 topo maps 64, 65, 66. For the whole route you would need 63 and 69 as well. 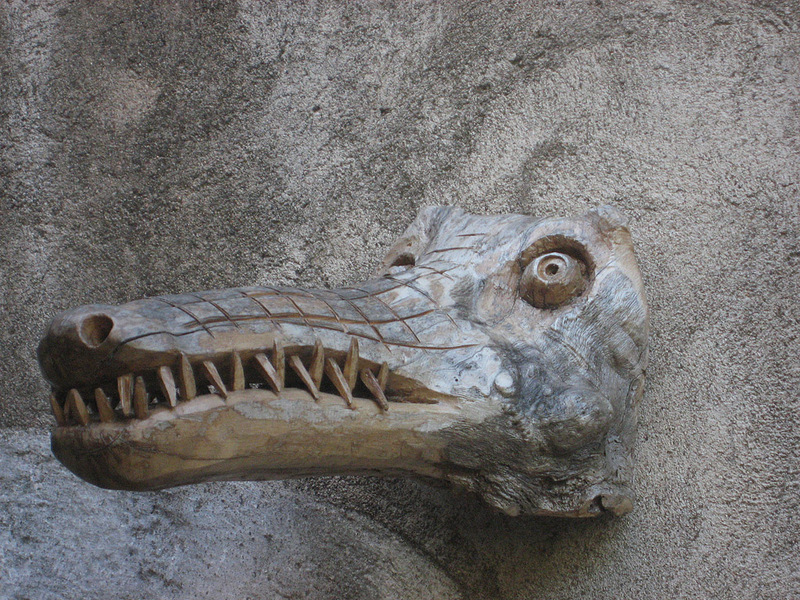 You can get these various places online, for example http://www.francewalkingtours.com/ . I highlighted the route and cut it out so we just had strip maps with topo info. We can barely read French, but used the strip maps from the Balen & Siréjol guide daily, the text rarely. I got the Lepere guide because it had maps in the back that I thought were more detailed than what we had, and it had some city maps. When I looked at it closely, I realized that the maps in back were the same as the IGN maps we already had, though in some cases their trace of the gr653 route was more accurate than on the IGN maps. Their city maps were office of tourism city center maps of Arles, Montpellier, Castres and Toulouse with the gr653 route added. I would not carry the Lepere guide again unless I read French much better. I would just print the city maps from the internet. The 1/100000 maps are available on a cd from ign, as well as in hardcopy, but the cds are very expensive. They also have 1/25000 maps available hardcopy and cd/dvd - these would be overkill in my opinion. The best I can tell, the GR 653 runs thru departments 30, 12, 81, 82, 32, 65, 64. Arles is in dept 13, but you are almost instantly out of it. "and turn L onto the chemin d'Etang." As printed, it now says turn R.
Until after Montpellier, marginal - frequently painted over or absent, and in some cases there were reroutings where we had to decide whether to follow the CFSJ directions or the waymarks. 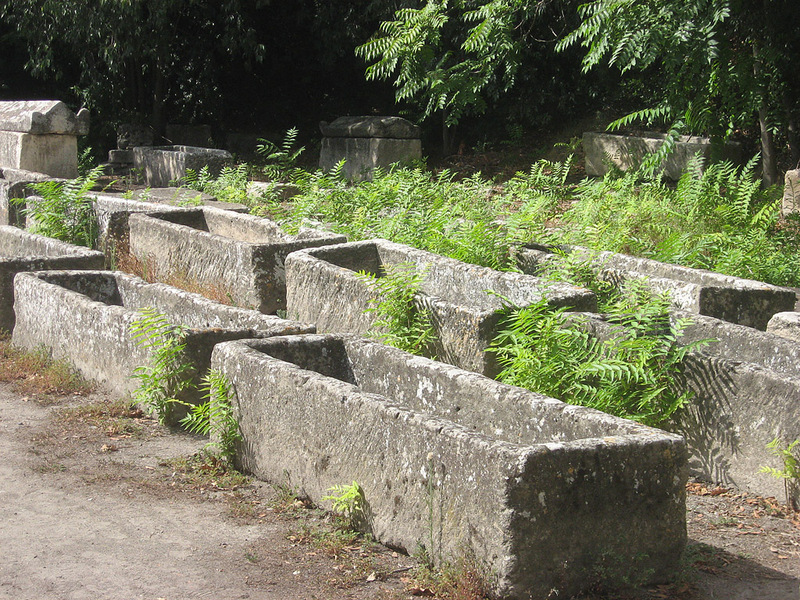 Sometimes the waymarks didn't correspond to any of the guides, and the guides didn't correspond to each other. After Montpellier they were there, but no paint was wasted on extra waymarks before absolutely needed, and it helped to have two pairs of eyes looking for waymarks. The first three days, we got lost every day for a short while, and in going into Vauvert, were totally lost, and just kept asking people for the direction to Vauvert, and kept following small roads and flagging cars for information until we got there. Some of that is just getting adjusted to the style of a particular guidebook's directions. On page 12 last paragraph in the CFSJ guide for getting out of Arles, the beginning of the sentence gives multiple details on street by street basis for getting to the edge of town and without taking a breath ends with "to the D37 at Saliers". We use our Balen and Siréjol strip map to guide us, and eventually find that the D37 is some 12km and many intersections later. We made reservations ahead every night - sometimes two nights ahead for weekends, except once for Montpellier. We thought a big city would always have someplace, so didn't call till Vendergues. Montpellier city center was totally booked & after about 10 calls to tourist office & hotels, found a place on the outskirts of town that we had to taxi to. As it turned out, it was within walking distance of the tram, so the next morning we were able to take tram and bus to Grabels. We didn't call Castres till night before, and couldn't find a place. Our gite host then called for us the next morning, and amazingly enough, found a place for us at a hotel that we had called and got a "complet" response. We booked a couple of days ahead for Toulouse, and a good thing, since we got there in mid afternoon, and all the hotels we saw, including ours had "complet" signs on the door. Since our French is poor, we first called miam miam dodo places with an English spoken flag, but muddled thru in French if no English sites. We couldn't handle places that just had an answering machine in French. We did not book at pilgrim minimum cost accommodations if others were available, thinking those should be reserved for those going all the way to Santiago. Several times we booked in a gite just to meet other pilgrims and found we were the only ones there. Another time the muni gite was full and they put us into an overflow gite, and we met maybe six other pilgrims. We saw few to no people walking during the day. There was a group of five French women who always seemed to find some unlisted place to stay, but our French wasn't up to that. Robert of the "Solitary Walker" blog told us he usually walked into a place without reservations, and found a place, but he was staying at the lowest cost church based or municipal based facilities. Incidently, it turned out that Robert and I were both following Rebekah's Moratinos blog moratinoslife.blogspot.com . For the first time we carried a cell phone. I ordered an unlocked quad band gsm phone online, and bought a Orange sim card and Orange recharge card from a France Telecom store in Paris. That gave me about 50 euros of time. I had to add about 15 Euros later. It was very useful for this trip. One problem - the charger. I fully charged the battery at home. After about a week in France, I tried to recharge it, and the charger failed. I had assumed the charger would handle 240/110 volts ok, just as my camera battery charger did. Not so. We finished the walking part of our trip on the original charge to the battery. For the last night, we had to ask our host to phone ahead for us. When we got back to Paris for the return home, I asked the hotel if they had a spare charger. They brought out a box, and one matched my phone, so I am ok for next year. When you buy a sim card in France, they will need a local address. We just gave them the name and address of our hotel and that was ok with them. The last few trips we have just ordered a sim card from www.Rebelfone.com and it worked out ok. 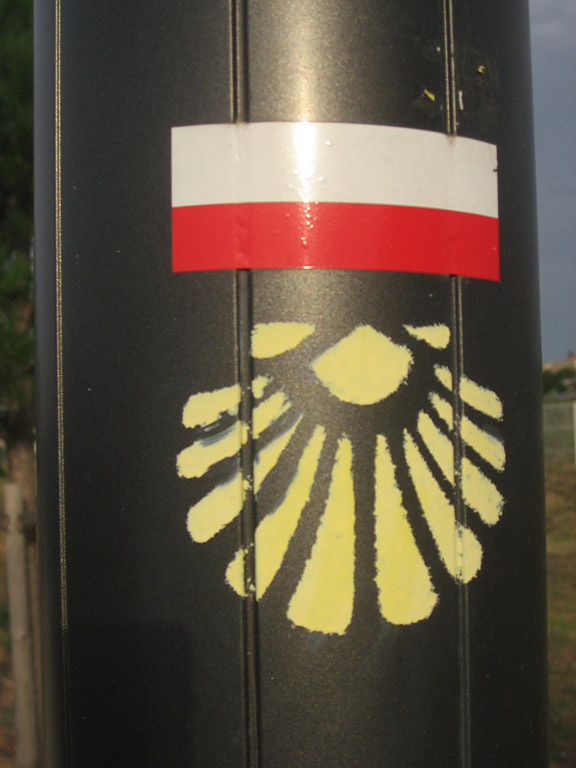 In general the waymarks are missing, infrequent and/or altered in cities. It is helpful to get the tourist map of the city. In case of the larger cities there are sometimes two maps - the town center and a larger area map. Get both and use your guidebook to trace your route out of the city ahead of time. As I get time, I will post the links to the appropriate city maps below. The CFSJ guide is a little jaded about cities, talks about dull walks thru suburbs. That may be true for Europeans, but for us, any walk thru a European city is interesting and the ones on the GR 653 were no exception. France has a government supported site - http://www.geoportail.fr/ - that has online interactive views of street maps, topo maps, and photo image maps. The image maps are not Google Earth, but a similar product. To get right to the GR 653, enter http://www.geoportail.fr/visu2D.do?ter=metropole and in the search box at the top left center (Aller À) enter Arles as the Ville and Place de la Republique as Addresse. On the resulting map, there is a directory on the left (Catalogue). Click the Cartes folder open and check the Cartes IGN box. Click the photographies folder open if it is not open, and check the photgraphies box. 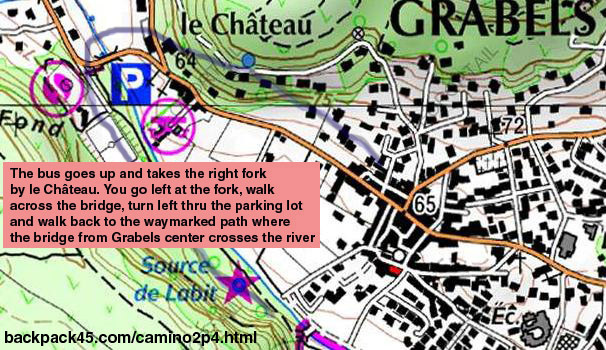 Set the right vertical slider to just above Rue, set the left Carte IGN slider to about 50%, and the Photographies slider to about 50% Then take the hand, and start dragging the map to the right, and you will be able to follow the GR 653 west.The GRs will show up as pink lines, and are labeled. Experiment with all the sliders for levels of detail. Again I had to setup a Google map with the route. Not sure of the waymarks out of town as we got lost here, but this route will get you back on the waymarks. The CFSJ route just goes thru the edge of the city. The route in the Lepere guide goes thru the city center and then joins the CFSJ route as it exits the city sw of the Pont de Metz. The waymarks stop at Place Soult where the Lepere variant starts. There are a few on the Lepere route, and they resume again as you follow the cfsj route down Emilie de Villenueve and cross the Durenque. I've added blue arrows on the two maps below to indicate the cfsj route and red arrows for the Lepere variant. The only map I could find is a nice interactive map. The blue line is the tram 1 line that goes to the euromedicine station where you can catch the 24 bus to Grabels. The waymarked route comes up from the bottom into the middle of the city. There is another route east of that, which follows the Canal de Midi and is a little shorter and closer to accommodations. I've marked where the Champagne station is on the Google map above. Waymarks begin at the Champagne station, and I've traced the start of the trail there. We ended our 2008 walk at Dourgne, so needed to get from there to airport at Toulouse. Taxied to Revel and took bus. In 2009 bus from Toulouse back to Revel & taxi to start point. See this link for Toulouse area bus lines Bus lines 56 and 57 are the ones between Toulouse and Revel. Click on the links to the right of the line to see the schedule. One is summer hours, the other winter hours. Auch Maps with GR 653 Route. Saint-Gilles to Vauvert - this is one of the few lunch break towns. We got lost on the CFSJ guide page 14 1st para. Never found the turn sharp R along a wooded valley-bottom. Last waymark before was round irrigation thing on ground. X in right direction and normal waymark straight ahead, so went straight. At next T no waymark any direction though we walked about 100 yards on each option. Finally started asking farm workers way to Vauvert and stopping passing cars, and eventually got there. CFSJ GR 653 Guide P14 11k to Gallargues. Gallargues - if you stay at the excellent Lou Cigalou CH in Aigues-Vives, you need to call them. Don't call where the gr653 leaves the D363, but walk up the D363 about 1/2 k to the trailroad tracks where there is a little unattended Gare with parking areas. Call from there and say you are at the Gare. The CFSJ guide and the miam miam dodo frequently use the road numbers, but there usually isn't a sign on the road giving the numbers, and the locals don't know the road numbers. Leaving Gallargues - waymarks missing or misleading, but walk on the road on the left south? Edge of the A9 towards the bridge, and under the bridge you will find the waymarks again, leading to Villetelle. Leaving Villetelle, the waymarks don't correspond to any guidebook, don't take you past the roman bridge, but instead head straight for the intersection of the A9 and D34, and from there follow the A9 on one side or the other to Vendergues. P21 Hostellerie St. Benoit on GR on way out of town. The 4k road walk along the river Hérault is incredible. Walk on the river side, and keep looking into the gorge, water spurting from the sides, wonderful. P22. Accomodations. 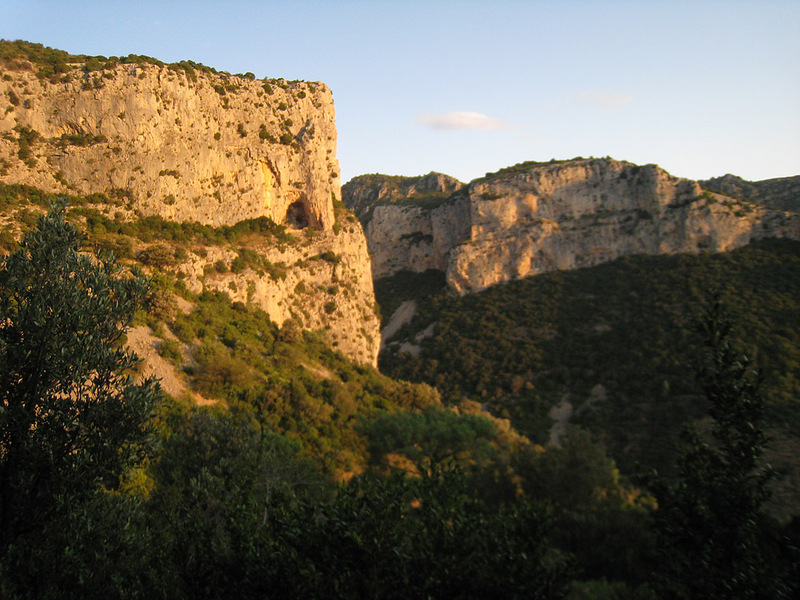 Saint-Guilhem-le-Désert is a beautiful little village, and the climb out of town the next day is your first taste of a true mountain trail. We stayed at Hotel Rest. Guilhem de Orange at foot of village. Joncels - CH Villa Issiates excellent accomodations and food - pilgrims welcome. 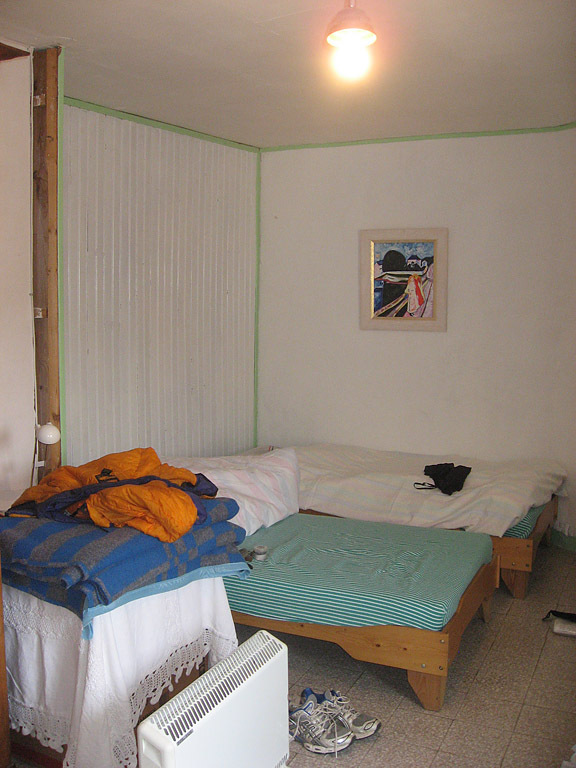 P28 accomodations: Le Bousquet - CH La Borio - nice - about 1/2 k beyond town away from trail. Owners English - American - give ride back to trail. P30 Saint Gervais - we stayed in a low cost private gite - Mr. Michel Bros. We were the only ones there, and they shared their meal with us. They spoke English. His mother had made the wine. P35 Accomodations Anglès - Gite La Guariguette - historic hotel now decorated with artistic flair - we were only ones there. Had our own huge well lighted room. Neighbor let us in. Owner prepared simple meal for us. P37 Accomodations Boissezon - fine new public gite - we had our own room with double bed and shower. Cafe owner was host and found us a place to stay in Castres. If you are planning to stop or start your GR 653 section here, This is a city link with your transportation options: http://www.tourisme-oloron.com/A-facilitated-access On our last trip we stayed at Hotel de la Paix, which is close to the train station and conveniently located. Note: there is train service in Oloron to Pau, etc. This was a somewhat difficult and stressful trip for us. Our plan was 20 to 25k per day and to use B&Bs and hotels when possible, not using scarce pilgrim gite space, leaving that for the pilgrims bound for Santiago. Looking back, that was not the best plan. I suggest staying in gites when possible, and a hotel or CdH every 3 or 4 days. Always carry enough food so that you have an emergency supper and breakfast that you can prepare yourself, given a microwave. Gites almost always have a microwave or stove. Also always have lunch and snack materials. We have a two pound tent I would carry if we had to repeat this trip. Some of the difficulties were unique to our trip, others you may encounter. Starting from Toulouse would be better than starting from Dourgne. Accommodations are infrequent and quickly filled in the area around Toulouse. This is a fine bicycle route, as you can adapt to filled accommodations, and just go on to the next. For walkers it is a different matter. As a walker, you need to reserve your accommodations if you expect them to prepare you a meal, and it is a good idea to reserve even if you just need a bed. You need a plan for when you can't get a place, such as a tent and food, a taxi, etc. The stages work a little better if you can easily do 30k per day. If you are staying in a place that provides breakfast, it is hard to get walking before 8 or 8:30. If we couldn't find accommodations within 25k, we would opt for a lesser distance. For 30k per day, it is best to get going by 7 or 7:30. Accommodations are frequently off trail, so your navigation skills must be good. Always carry lunch material. It is very rare to find more than one place per day where you can buy supplies, so when you hit the village of the day, get what you need. I also suggest carrying snack material so that you have something to eat about 10:30 in the morning and 2:30 in the afternoon. That snack should provide lots of salt and sugar to keep you going. For most of the trip, we found we didn't have much energy after walking the first couple of hours. Late in the trip we decided that this was probably an electrolyte imbalance due to hours of sweating, and at first opportunity started carrying bags of potato chips. This helped quite a bit. Energy bars of some sort would have been a good idea, but we never had our act together enough to get some. The little Casino groceries didn't have them and supermarkets within walking distance were rare. On the plus side, as this was September, there were lots of figs on trees hanging over the trail, so we got some fruit intake. (We would never reach over a fence or onto a farmer's property, but we figured that anything in the airspace directly above the road/trail was fair game). We had a number of days in the 80s (ºF) and a number in the 40s, a couple of days of rain and boot sucking mud - the rain happened to coincide with few days of dirt tracks. Humidity very high for most of the trip. 95% of the time is on small paved country roads. Imagine a 10 inch pie 2 inches thick attached to your foot, and a softball on the end of your hiking stick, and that is boot sucking mud. When we got home and looked at our pictures, it looked like the best trip we ever took, and in some ways it was. The people we met were delightful, the cities buzzing with activity. However, on the trail, we saw practically no one, maybe a dozen hikers over three weeks, including the ones we met in the few gites where we stayed. Many days were fairly boring. After several days of walking through cornfields, Susan said: "Are you sure we're not in Iowa?". Same feeling after walking along La Rigole - a small feeder canal to Canal du Midi - haven't we been at this curve a dozen times already today? The sameness also made the navigation difficult. Some areas were well waymarked, others scarce or missing waymarks. You had to count the little side roads, as they were not labeled. "Is this the 5th side road from the right, or the sixth? Well, it is a dirt road. Do dirt roads count?". We did this trip in September. That accounts for the lack of other walking pilgrims. In talking to our various hosts, we found that during April and May there is a lot of pilgrim traffic - frequently filling the gites. These are the people walking the entire route from Arles to Santiago. Many of them carry a tent and expect to do their own meals much of the time, though some have sent their tent home by the time they get to Oloron St. Marie. I have carried a small Silva compass, about 2x3 inches on all our trips, backpacking and otherwise, and rarely if ever looked at it. This trip I carried it and the map in my hand, and looked at it frequently. With all the little unmarked roads, and sameness of the trail, it was important to know exactly where we were. If we had off trail accommodations, we had to know that we were turning off on the right road. We carried the 1/100000 IGN maps for the trail. These are identical to the map pages in the back of the Sur le chemin de Saint-Jacques-de-Compostelle, la via Tolosona, la voie du soleil... - Francois Lepere & André Dehnel guide. (we didn't use this guide except the maps). We carried the Miam Miam Dodo, the CFSJ guide, and the Le chemin d'Arles vers Saint-Jacques-de-Compostelle, Louis Laborde-Balen - Jean-Pierre Siréjol guide. We mostly relied on the CFSJ, the MMD and the map and compass. If I were to do this part of the route again, I would look for more detailed maps. Excellent maps are available interactively on http://www.geoportail.fr/ but they don't print out easily. Since we got back I've been looking for better maps. You can get the 1:24000 IGN maps, but it is costly and heavy. There is a website www.geolives.com that allows you to download topo maps of Europe, and load them to your iphone or pda. You can also print them. It looks like a possibility, but I haven't tried it. In 2008 we carried an unlocked GSM phone and bought an Orange sim card when we got to Paris. In 2009 we ordered a sim card in advance from www.rebelfone.com . The Orange card is prepaid, and we had to buy cards to top it up as we went along. Orange also now has a cheap cellphone that you can buy with initial minutes when you get to France. However, the Rebelfone has worked out ok to make calls. When we got the sim card, it had the phone number on it, so we knew our number in advance. We were able to make calls without problems throughout southern France. We still haven't gotten the final charges on our credit card, since they have to wait until the charges from the French carrier come through. Hopefully they will be reasonable. Orange is the French carrier. This was a rather difficult trip for us - just the circumstances, not inherent in the routel You can find out trip notes and expanded comments on my blog entry for Dourgne to Oloron St. Marie. and you can see my YouTube of the trip. This was a great trip, again, just the circumstances. You can find trip notes and expanded comments on my blog entry for Oloron to Logrono. Also, if you haven't looked at my YouTube video of this trip, check it out. If you do this trip, do not miss the side trip to San Juan de la Pena. Stay over a day in Jaca and hire a taxi for the half day trip if you don't want to walk the side trip up the mountain.